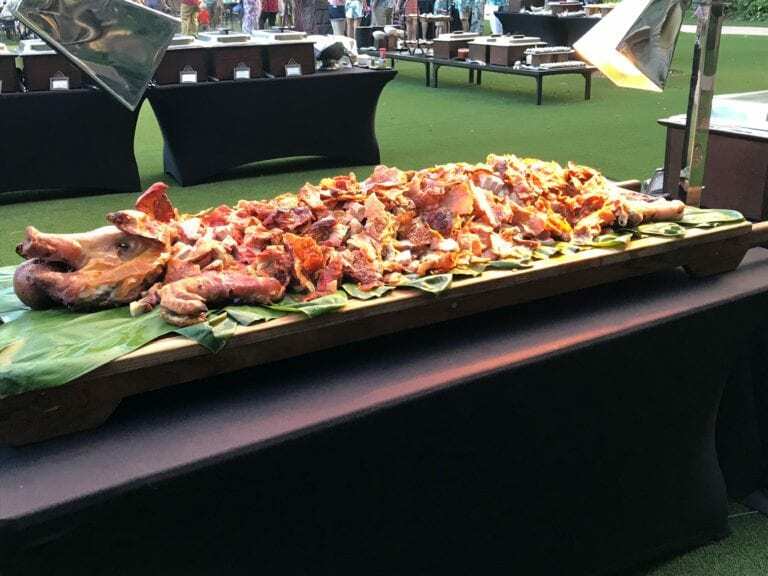 I was pretty certain, at that special age when everything is mortifying, that attending a luau in Hawaii is a type of embarrassment specifically reserved for tourists. I was 14 and I knew it all. 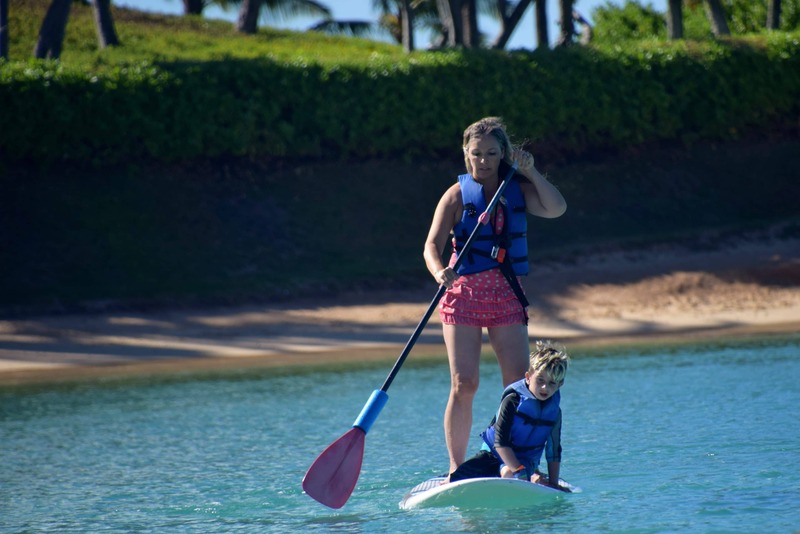 This appraisal of travel in Hawaii stayed with me until my own little family visited Ko’Olina, a resort town on the western side of Oahu, in Hawaii. 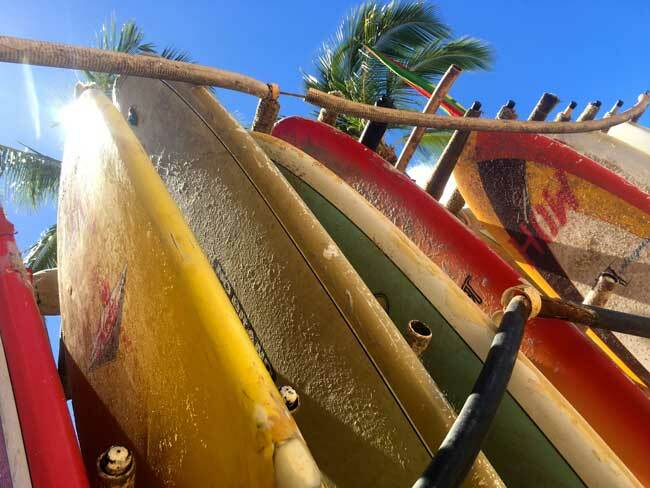 A deeper understand of the islands’ actual cultural life began when we stayed at the Aulani, a Disney Resort and Spa, set on 21 gorgeous, ocean-front acres in Oahu. 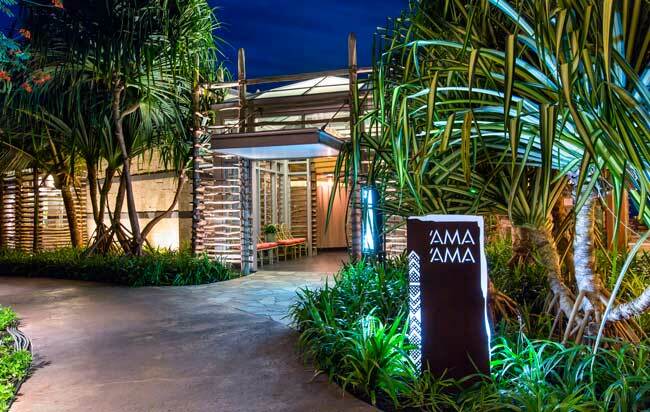 The name of its lobby, Maka’ala, translates to eyes wide open, and those eyes, in the form of floor-to-ceiling windows, displayed lava rocks floating in filigrees of turquoise water. 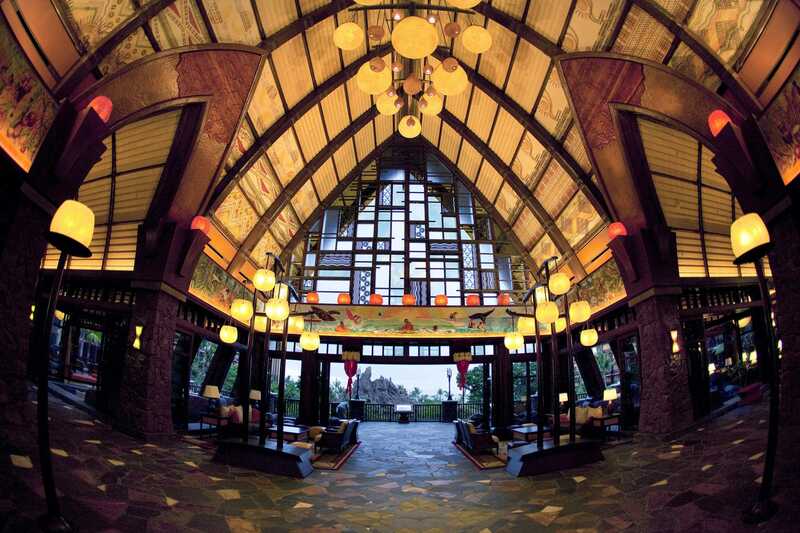 To our surprise, instead of the expected theme park’s primary colors and crush of Disney characters, the Aulani dressed in earth tones, polished wooden beams and blocks of stone that graced the floor and curves of the lobby. Overhead, smooth wood pulled into the shape of a canoe that traveled down the ceiling much like the canoes that connected the ancient people of the Hawaiian Islands. Where the canoe line ended, Artist Martin Charlot’s 200-foot mural of ancient warriors, farmers and dancers reminded visitors what Oahu once looked like. 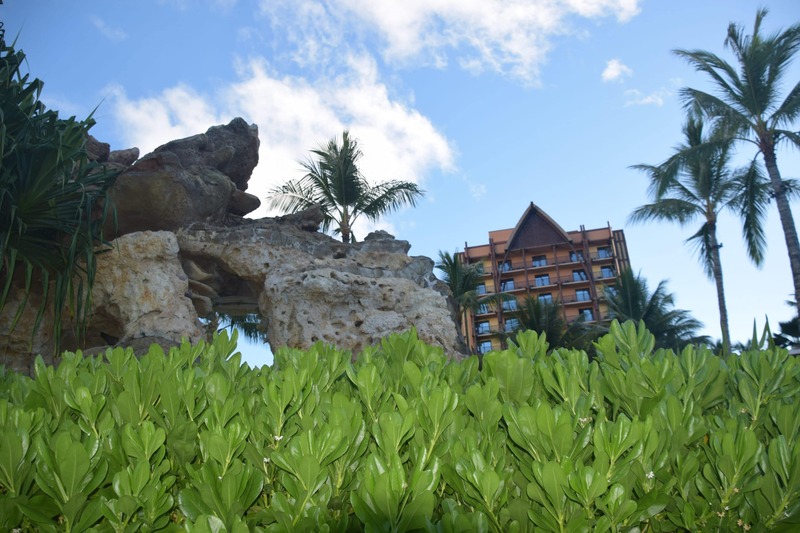 The Disney Aulani resort, designed by Imaginarium executive, Joe Rohde, is divided into two parts, I learned all this and more on a tour available to visitors. One side of the resort devotes its art and decorations to honor the males of its ancient society and the other pays tribute to the females. On the female side, goddess Pele´ dances with her disciples in a framed fresco, on the other, warriors head off into battle. This theme, we found, extended into the rooms as well. 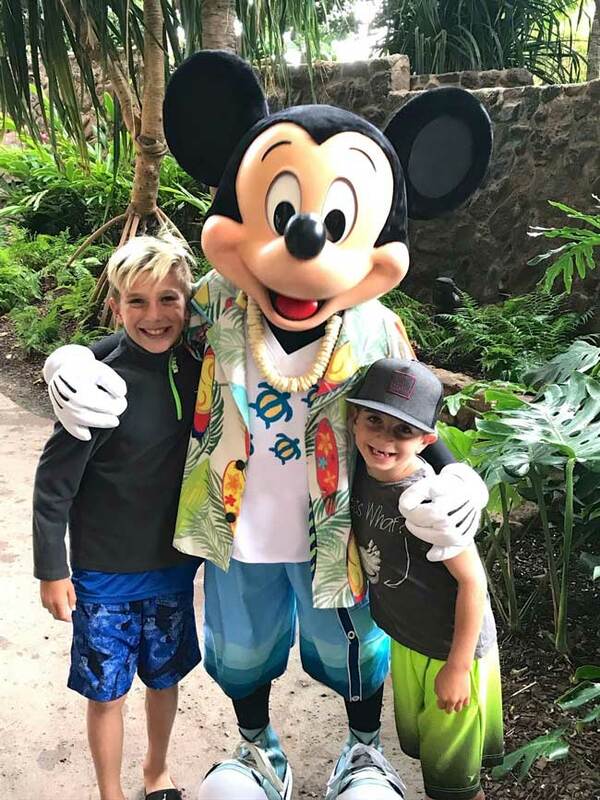 Although we did glimpse our favorite Disney characters strutting around palm-tree lined paths in beach attire, the resort makes every attempt to stay true to Hawaiian life. 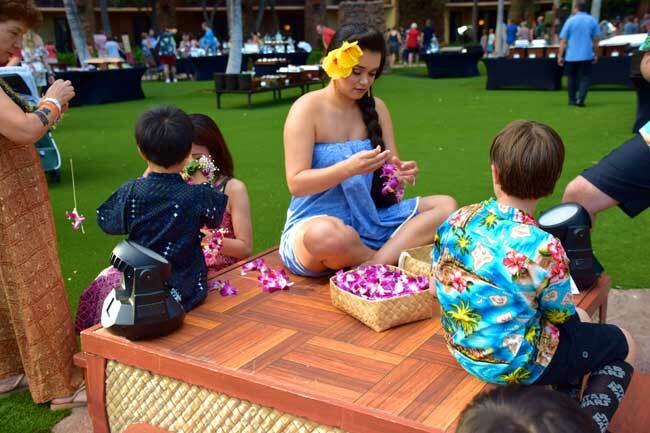 “We worked with a cultural committee to ensure we were honoring authentic Hawaiian culture,” said Noriko Harimoto, Public Relations Manager for the Aulani. A celebration of that culture is everywhere, including the kid’s club, which is aptly named Aunty’s Beach House. Islanders believe that even if a person is not of your bloodline, they are still your ohana, your family. Because of that kinship mentality, adults are referred to as Aunty or Uncle by keiko, the children. The Aunties and Uncles at the Beach House extended that hospitality to my boys, ages 7 and 9, throughout our stay. Our boys proclaimed it was the best kid’s club they’d ever visited. 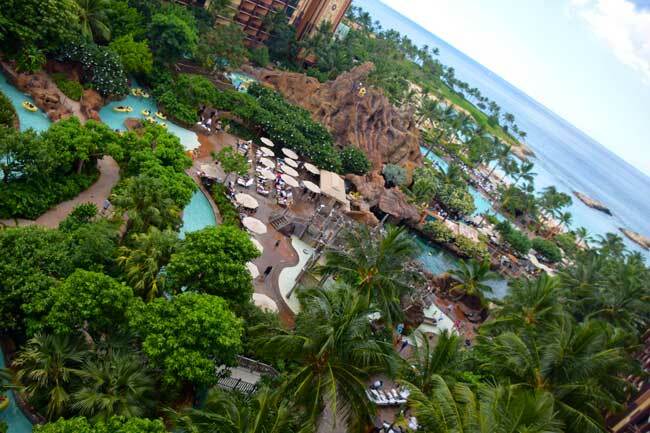 In the heart of the Aulani resort is a 7-acre water park called Waikolohe Valley, which translates to mischievous waters. Our favorite part of it was the two, curvy water slide tubes. The first time we tried it, the four of us trudged up the stairs with our double rafts and plopped them into the top of the platforms. My husband and I got in one raft, our backs to the boys, who were in another. 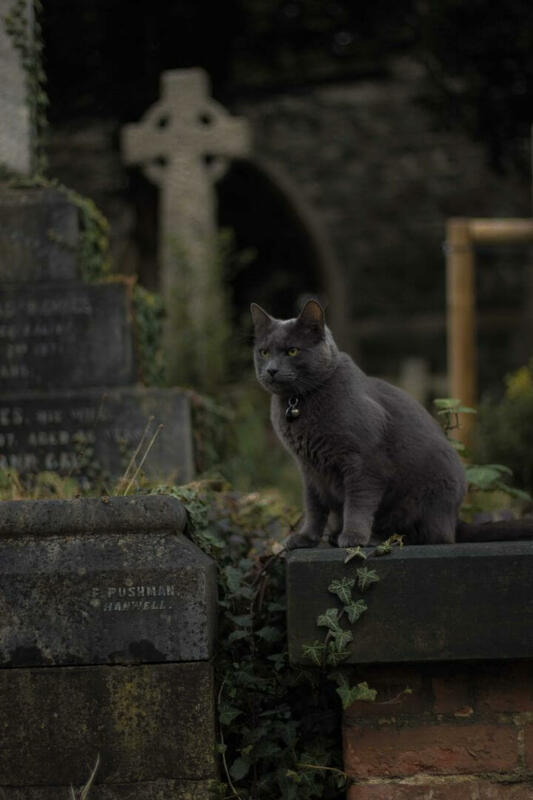 We waited for the green light to signal the time to push off, plunging us into the dark abyss. The tubes amplified our screams as we slid from side to side, not knowing when each bend would rocket our bodies into the next curve. Water splashed into our mouths and eyes as our fingers gripped onto the straps of our raft. The tube spit us into a pool of cool water, seconds before our boys got there. Their hands reached around our necks, laughing, screaming, and promising swift revenge. Closer to the beach is another pool, the Kamaka, a place to chill under a waterfall. It was fun surprising the boys when we told them to go underwater. They came up with mouths shaped like big Os after hearing the songs of whales under the water! Not to be forgotten, babies and toddlers can relax in the mellow, zero entry Waikolohe pool. Rainbow Reef is an exotic fish habitat stocked with 40 varieties of local fish. Each person gets an inflatable vest, so even non-swimmers can enjoy the fun. Within the safety of the huge aquarium and the rented snorkel gear, we gazed as the technicolor fish swam around our bodies. 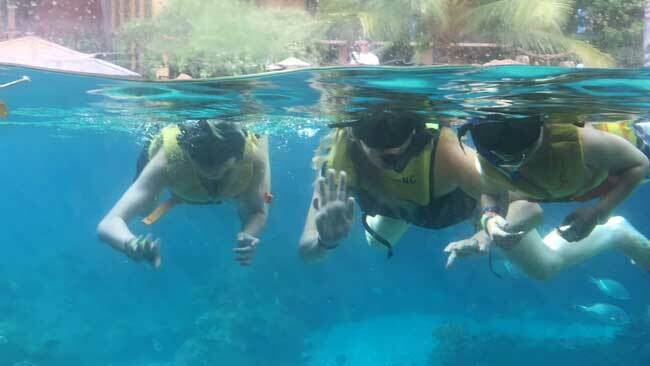 Snorkelers wave to spectators at the Rainbow Reef marine sanctuary – Pictured left to right: Knox Nehdar, Caitlyn Kelly and Kaleb Nehdar. It was nice not having to fight currents to swim with ocean life. There’s even a window, set within the water tank, to wave at less adventurous spectators or adoring grandparents. The ‘AMA’AMA open-air restaurant was a good spot for lunch. 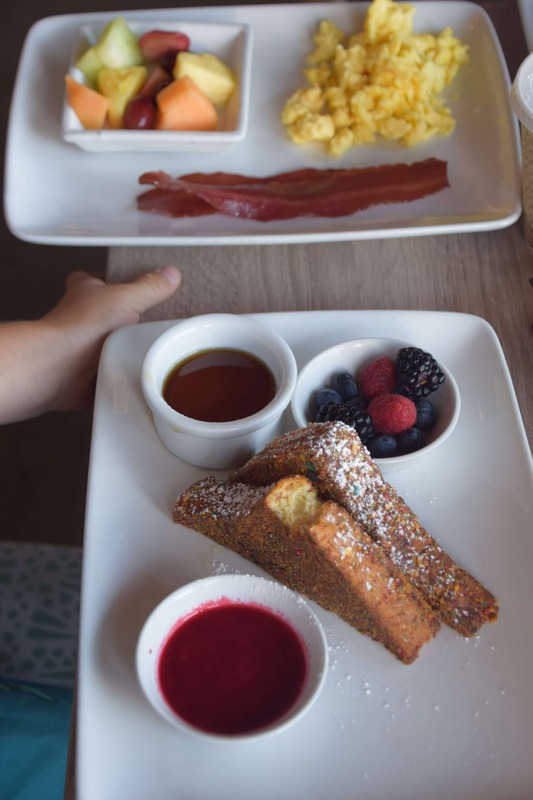 They have poolside service with all the usual kid favorites, and offer more sophisticated options for adults. 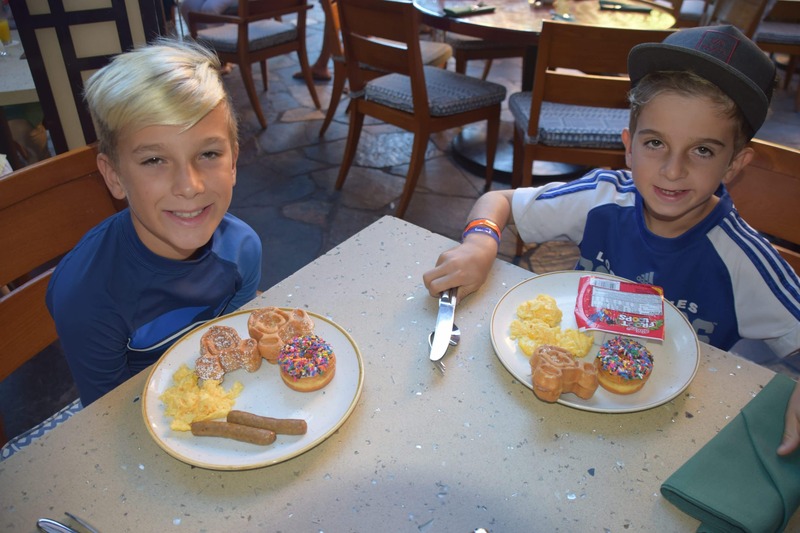 We enjoyed breakfast there most mornings because they have Disney-style kid options and a variety of international adult fare to discover. 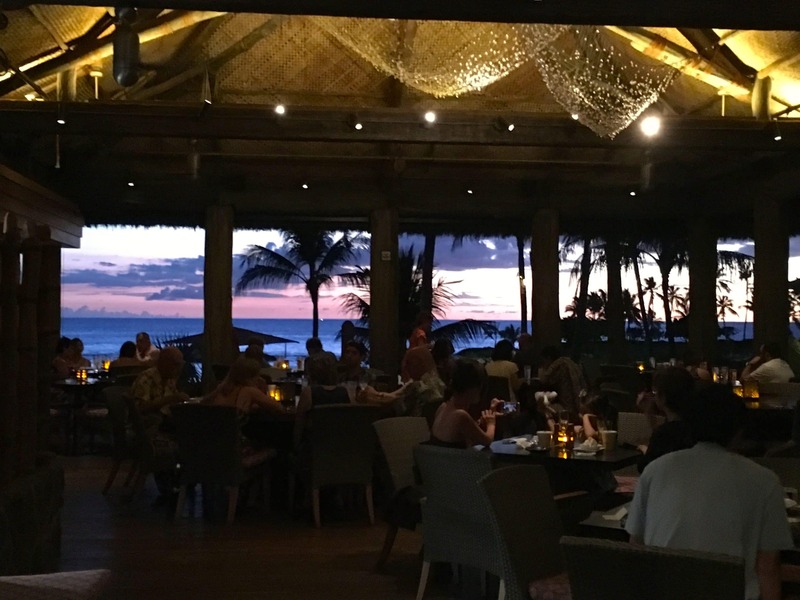 In the evening, the ‘AMA’AMA transforms into a more formal dining area overlooking the ocean. One night, we spoke with several locals about their take on how tourism is affecting Hawaii. Kevin Kelly, President of Triton Corp., said he thought the resorts springing up around Oahu were a good thing. “They provide jobs,” he said. His wife, Irene Kelly, a biologist for the National Oceanic and Atmospheric Association, worried about depleting the island’s natural resources. “The federal government doesn’t have the means to manage all the things needed to maintain a healthy ecosystem,” she said. Luckily, she told us, a program developed over two decades allows communities to partner with state and federal governments to protect the health of their island. 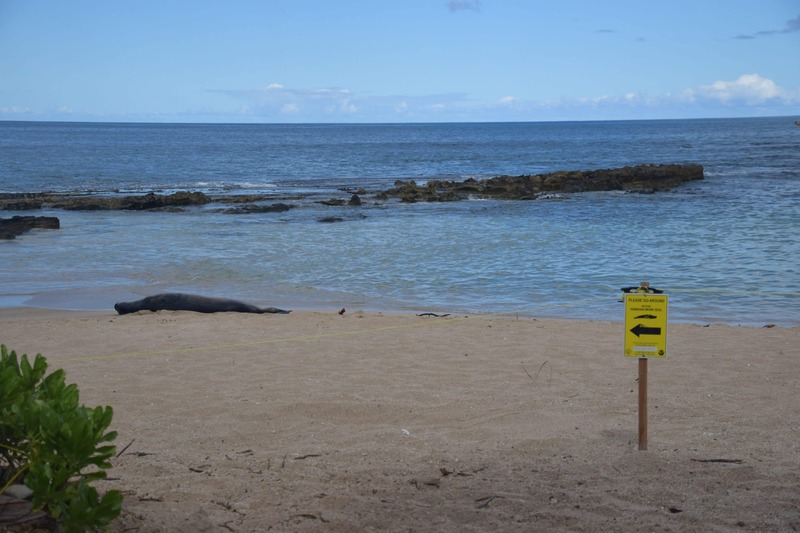 “In Haena, Kauai, the Community Based Subsistence Fishing Area (CBSA) was developed so communities could enforce their own environmental regulations,” she said. 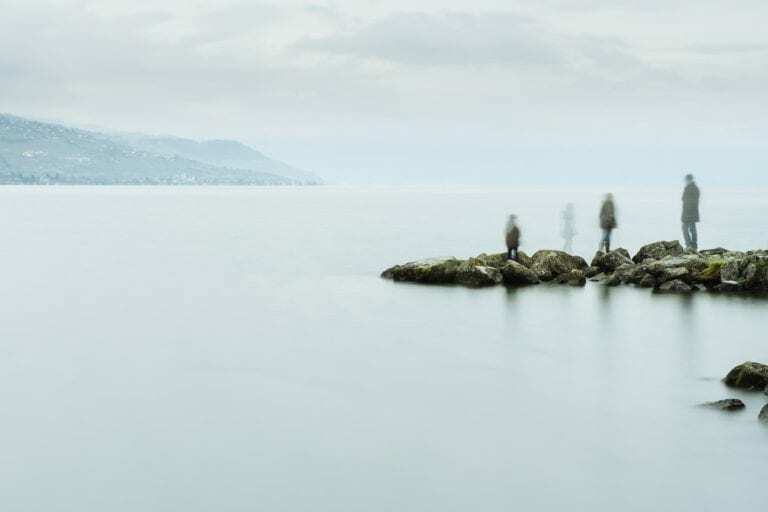 This was done in response to disappearing fish. But with CBSA as a role model for the other islands, that can be prevented, the couple hopes. Discussing this earlier, Harimoto told me, “We are a big H and a little d.” In honoring that big H, to preserve island life, Disney is the first resort in Hawaii to earn the LEED silver award. While the adults were discussing the fate of the islands, the kids noticed a nearby campfire with Uncle and Moana telling island tales. They ran to join the group sitting around the fire and learned about island folklore in the interactive presentation. By engaging the children’s hearts through stories, we watched as Disney created the next generation of conservationists who will hopefully continue to preserve island life. 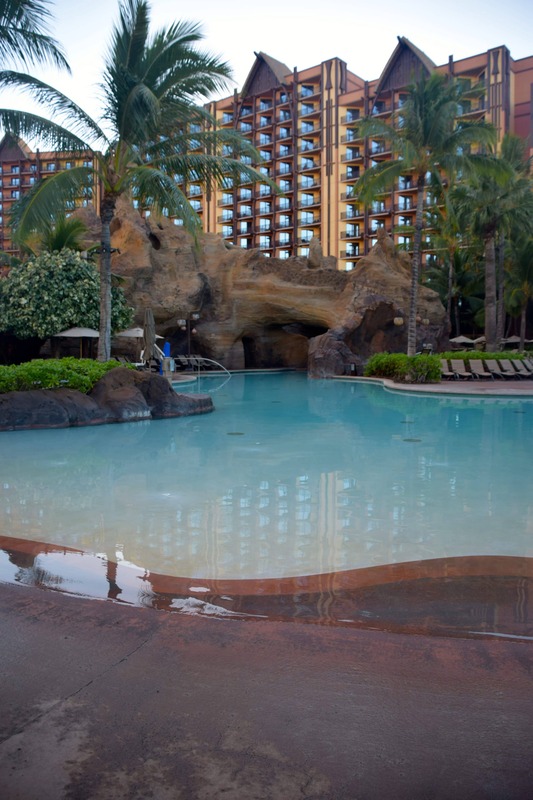 The next day, with the warm staff at Aunty’s Beach House entertaining the boys, we enjoyed the Laniwai Spa, the first spa created by Disney and built with aloha magic. It surpassed its name, which translates to freshwater heaven. 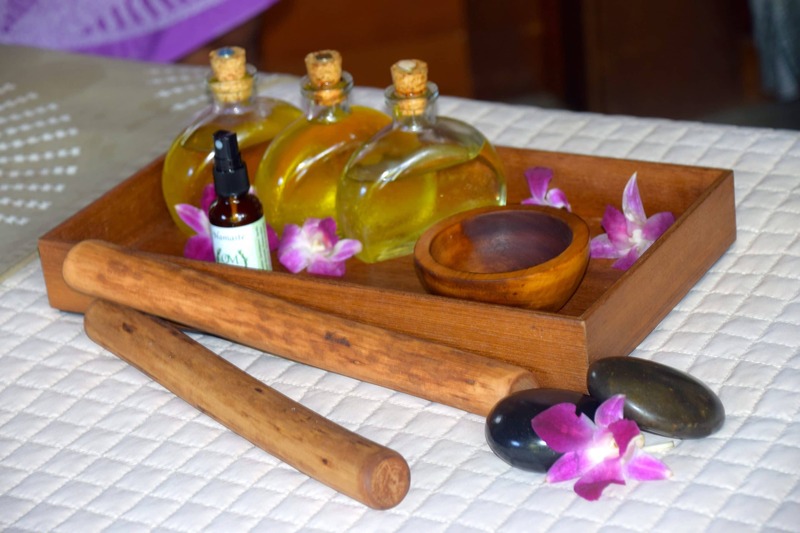 Lomi Lomi involves foot long guava wood sticks, essential oils and bliss. 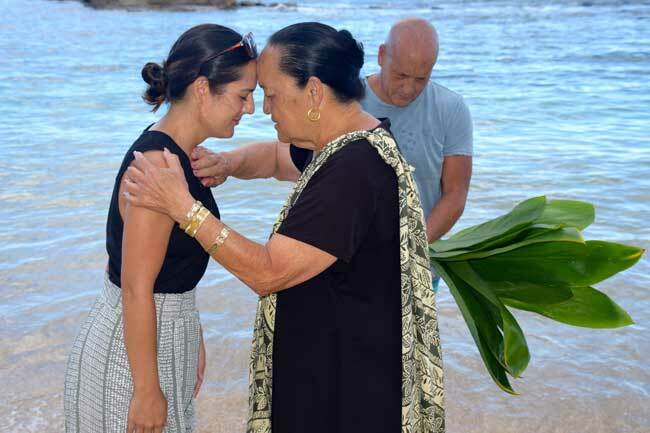 We learned that every Hawaiian family has within it someone designated as a healer. This healer practices massage and natural remedies within the family to keep everyone at their best. Divided into an outdoor hydrotherapy garden and an indoor sanctuary with a mind boggling (150!) array of treatments, the mostly adults-only spa is a retreat from your retreat. 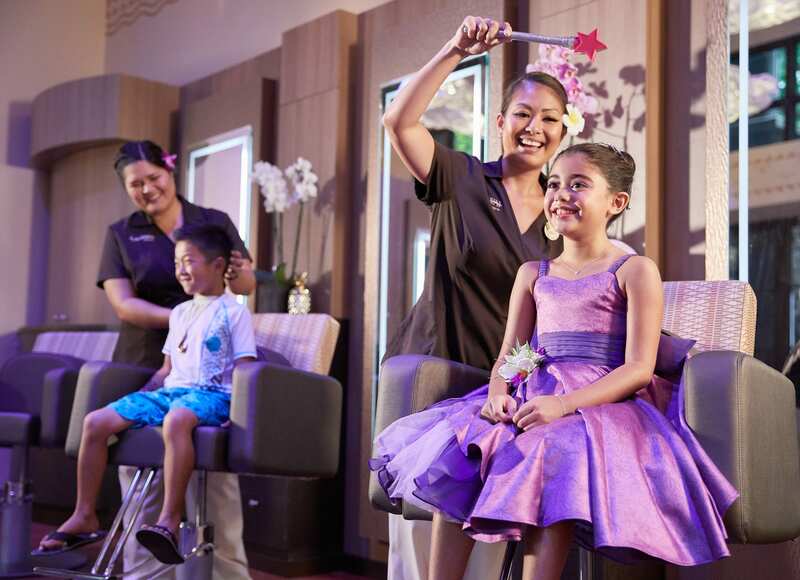 However, if more family time is what you crave, there’s also an Ohana Lomi Lomi massage for family to enjoy together. Now, if the kids are done with family time and are craving their “me time,” the Painted Sky: HI Style Studio offers them the chance to become their favorite Disney island character, if they are between the ages of 3 to 12, or transform into a more adventurous version of themselves with costumes, makeovers and accessories. This is new and wasn’t available when we went. I bet the boys would love to wear a loin cloth like Maui though. We’ll find out next time! One morning, I got some of that “me time” during sunrise yoga on the dewy lawn overlooking the still dark ocean. I said aloha to the sun, as it peeked into the sky, with poses and salutations . I watched the day unfold under layers of crimson, salmon and sunflower while reflecting on how lucky we were to be enjoying this. In my busy boy life, it was a rare opportunity of quiet, and I made a mental note to try and bring this moment home with me. 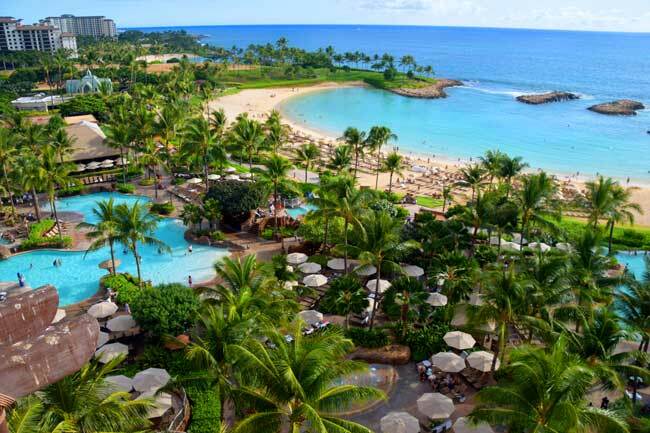 A short walk past the Aulani is its neighbor, the Four Seasons Resort. In front of the Four Seasons is a stretch of public beach called Lanikuhonua. 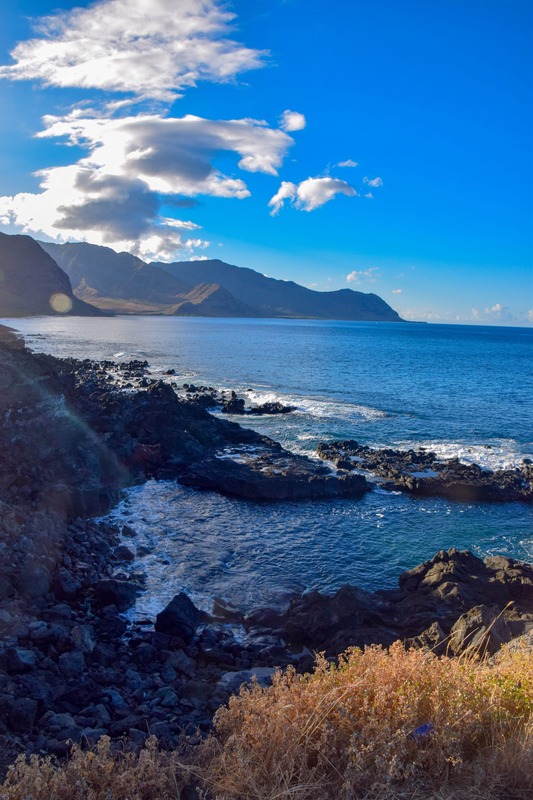 This was an ancient vacation spot for Hawaiian royalty. Today, it is home to a kahu, or spiritual guardian. Kahu Aunty Nettie is the oldest living resident in Oahu. Here, she blesses visitors in an ocean ceremony. After my blessing, I asked her what she thought about the changing island. She said she was pleased with the hotels on Oahu because they provided jobs that kept the kids close to home. 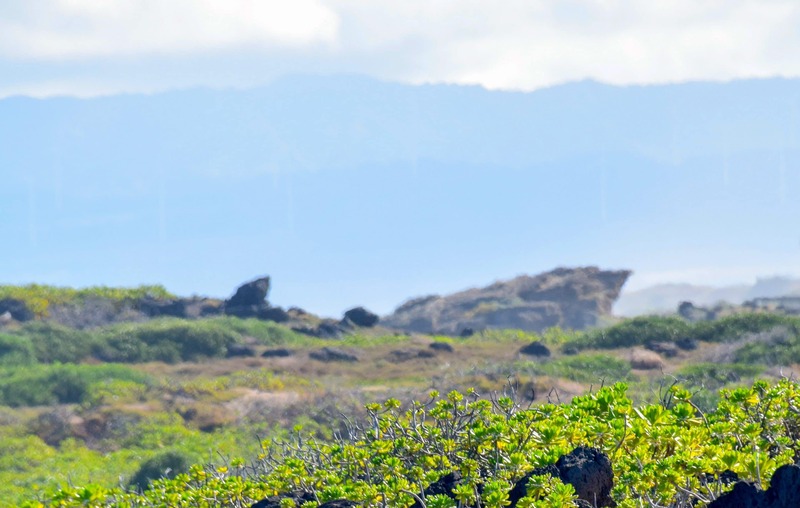 The Four Seasons has its own offering of island adventures that include a guided hike to Ka’ena Point, a half hour away from Ko’Olina, led by Kumu Hula La’akea Perry. 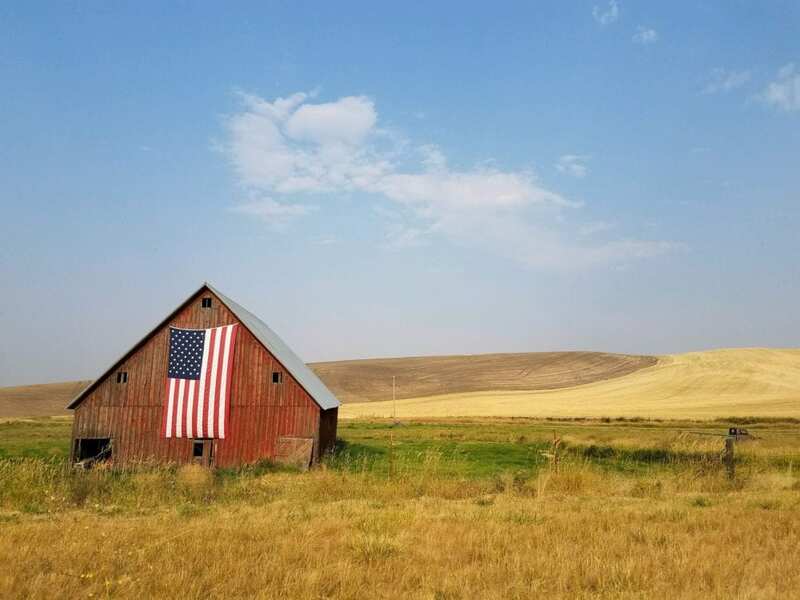 Once used by the United States military, it is now uninhabited. 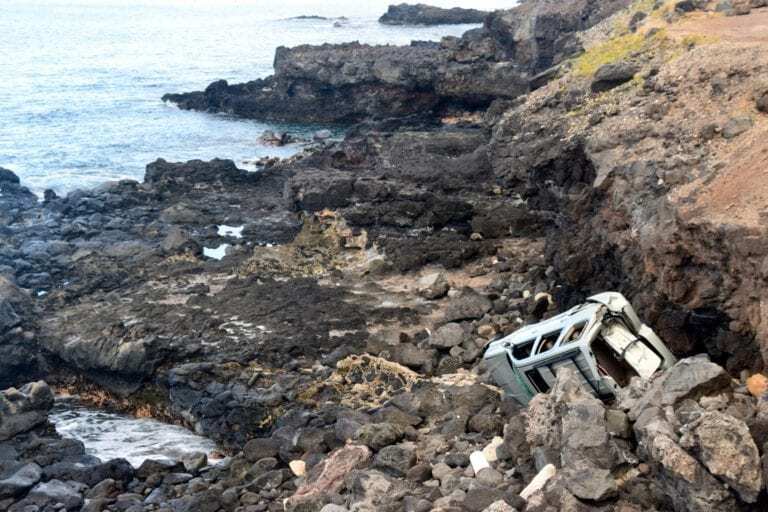 You may see a random car rusting below the cliffs where a silly person had tried to drive it…. …otherwise, the landscape is largely still wild. Swimming holes and a teardrop-shaped rock facing the ocean are the payoff. Kumu Hula La’akea Perry shared stories about the area (the best being the origin of the shaka sign – he told us the security guard version) and the rock, called Leinakauhane Point, which translates to leaping of the souls. It’s a sacred spot where islanders believe recently departed souls transition to the other side. 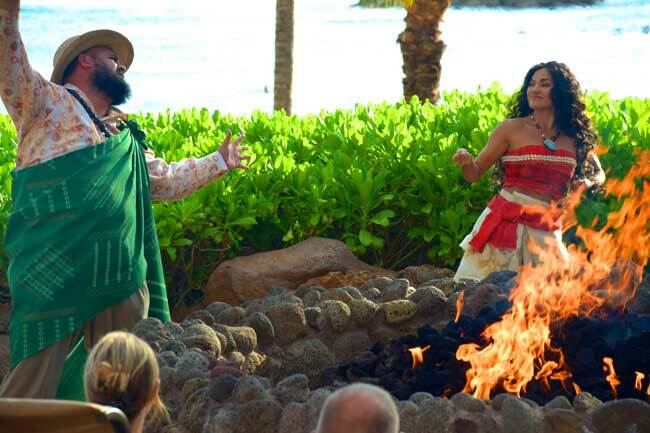 Then Perry and his partner, performed a sacred hula (see video below) that told the story of Hi’iaka (the favorite sister of Pele´) and showed a deep respect for this part of the island. If you decide to venture away from Ko’Olina, you won’t want to miss Waikiki Beach. Known for its white powder sand and long, fat waves, it’s about an hour from the resorts. 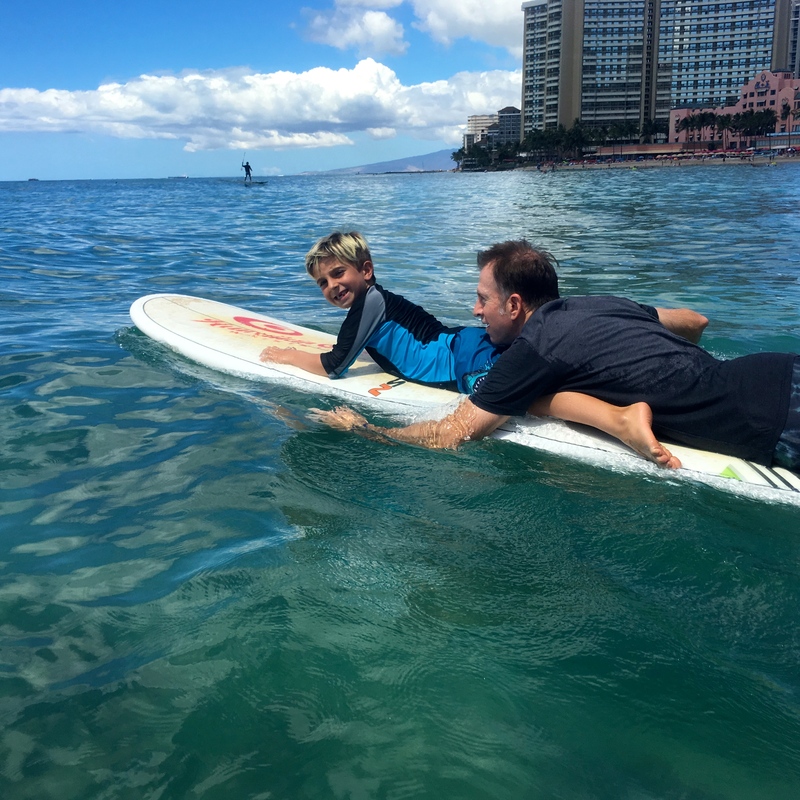 We rented surfboards and now can say we’ve surfed Waikiki, even though not all of us stood up on the surfboard. 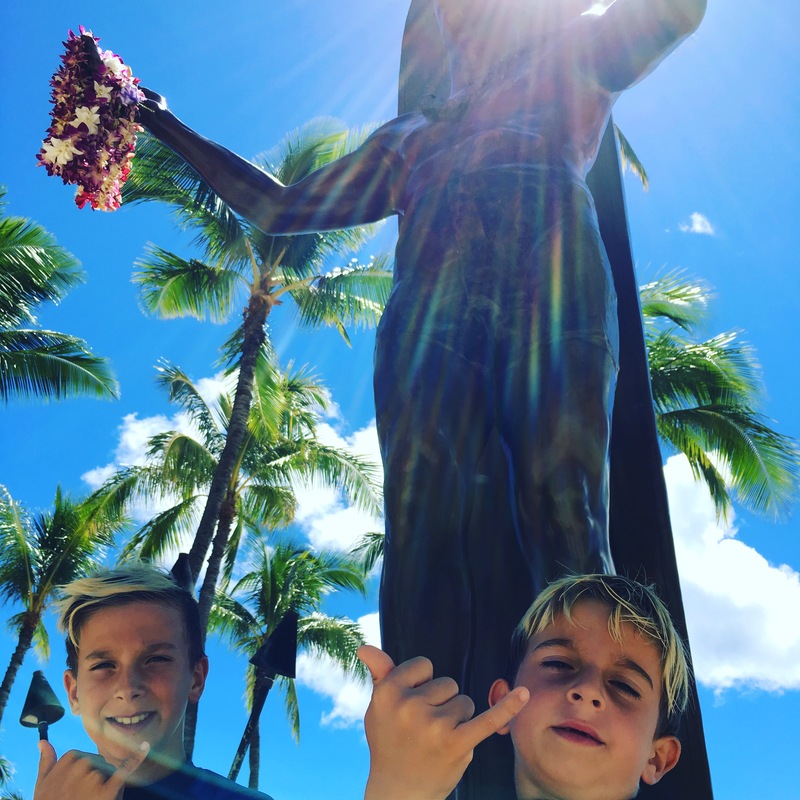 The boys definitely got into the island spirit posing in front of a bronze statue of legendary surfer and Olympic Gold medal swimmer, Duke Kahanamoku on Kuhio Beach. Our education ended at Aulani’s “Ka Wa’a” (canoe) Luau. Aunties and Uncles welcomed us with keepsake leis of Kakui nuts and tiny moss colored Mongo seashells. The boys received demi-god Maui fish hooks. 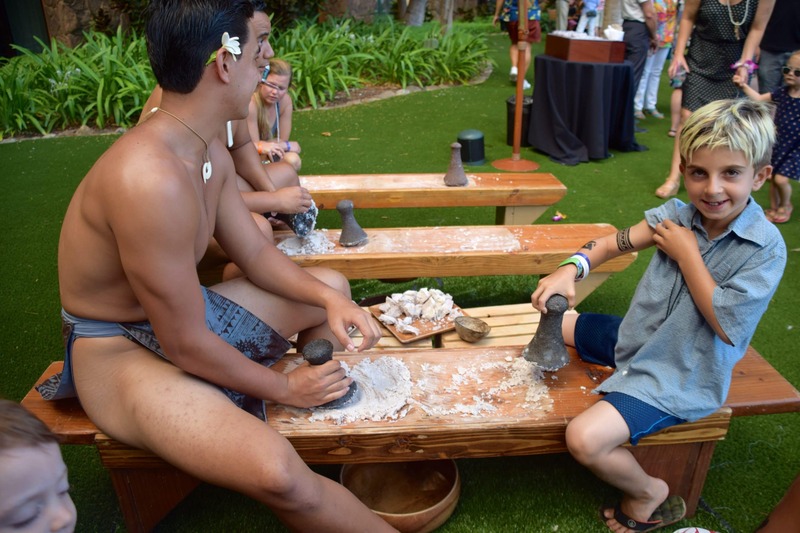 Island warriors helped prepare the feast by showing keiki, how to pound ku’i kalo, taro root, into a pasty poi. 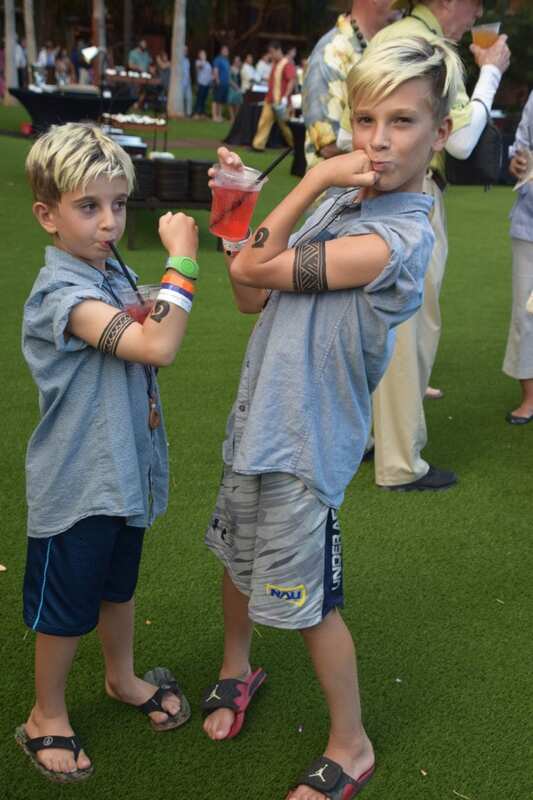 …then they guided the keiki in lei making, applied tribal tattoos and taught them hula dancing. 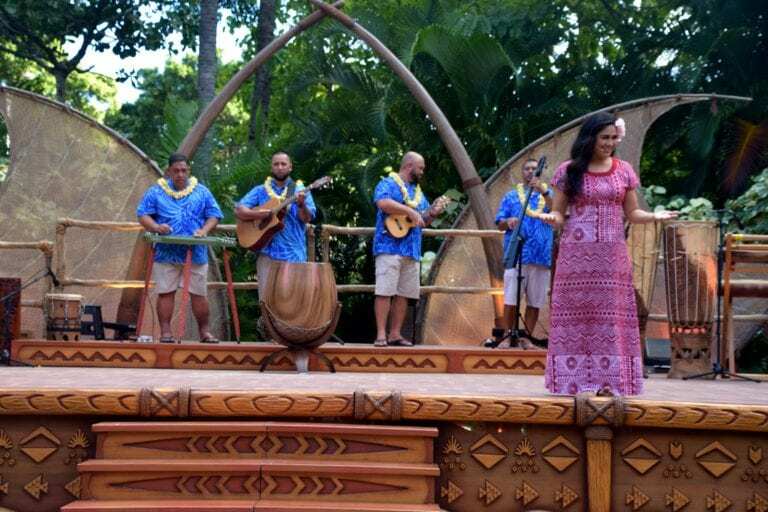 Through storyteller Noa and the dancers, we learned the history of the Polynesian people’s migration by canoe from Tahiti to Hawaii and their evolution into the present. The story involved fires and screaming and spectacular movements all set to a windswept island soundtrack. It was nothing like the luaus I remembered. Or. Maybe it was, but this time I saw it through open eyes. 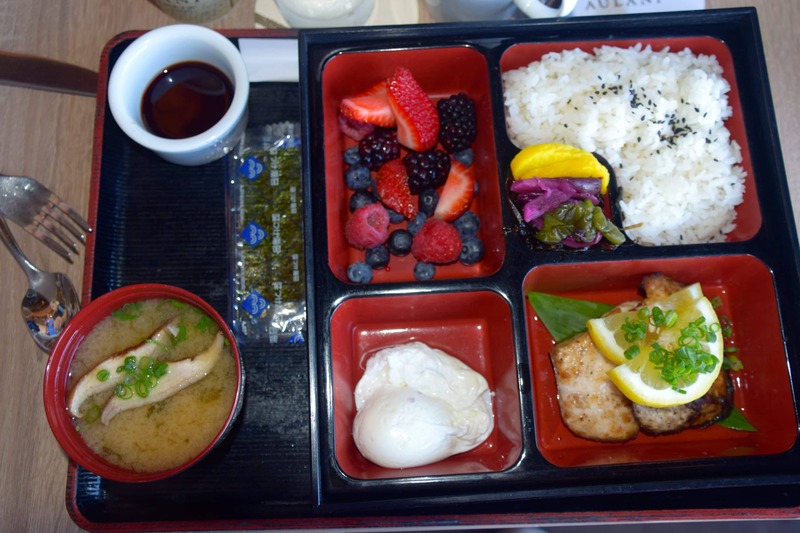 Try the character breakfast at least once. Yes, all the sugar will turn your loving children into crazy beasts but the food is colorful and comes in awesome shapes. And, it’s where all the cool Disney characters hang out. 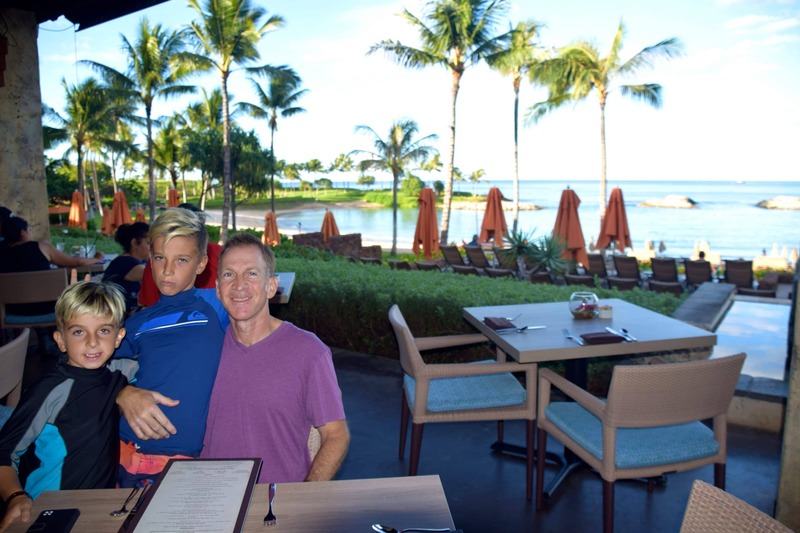 Despite their age, your kids will love when they stop at your table and pose for pictures with them. There’s dinner shows at the buffet too. Try the snorkeling and SUP in front of the hotel. 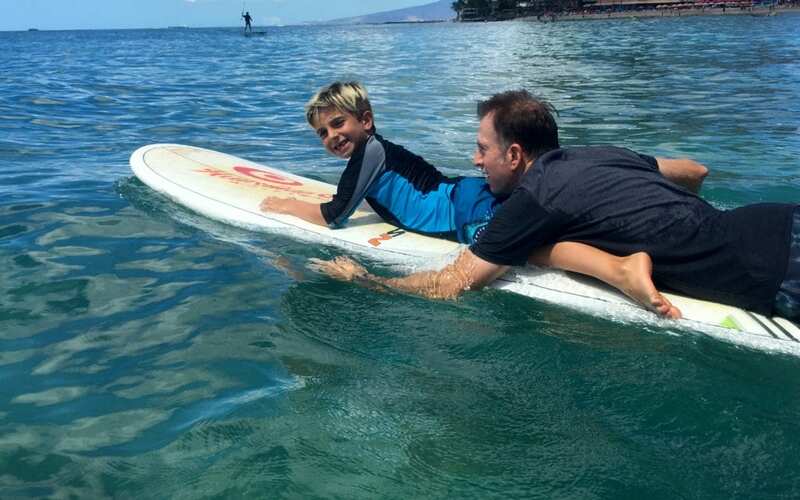 The water is calm and you could plop your younger kids on the front of your board while you paddle. 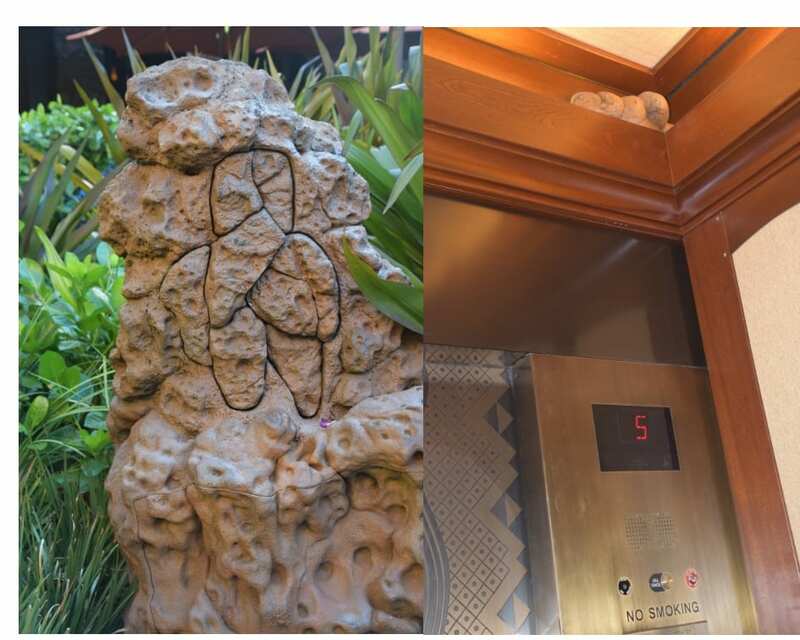 Keep an eye out for the mischievous Menehune, Hawaii’s little “magical people” hidden around the resort. There’s even an adventure trail, that’s sort of like a scavenger hunt, to find them. 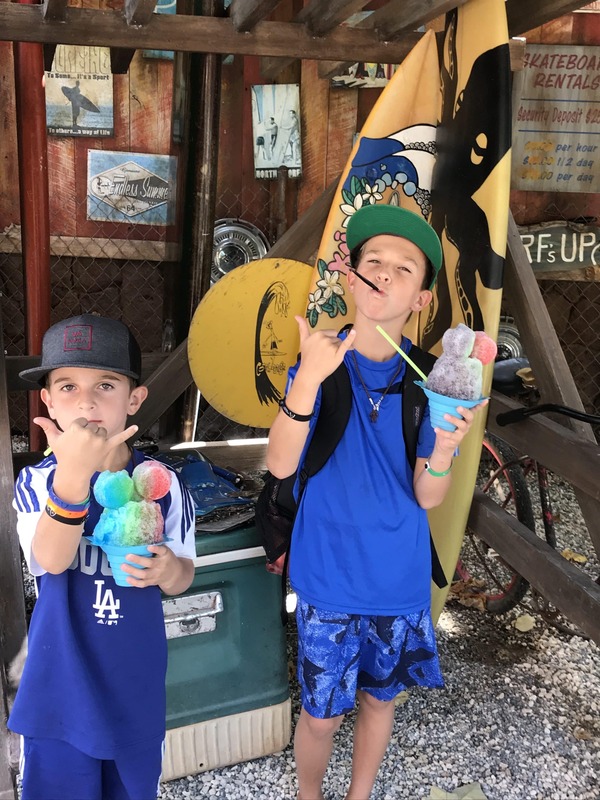 Everyone loves snow cones. Especially when they’re shaped like Mickey! Next door to the Rainbow Reef is your hook-up. And finally, since you’re on the island to explore a bit of history & culture, why not investigate the parts of the island that refuse to stay in the past by visiting some of Oahu’s most famous haunted spots? Everyone loves a good, scary story. Amazing!! I really want to go! 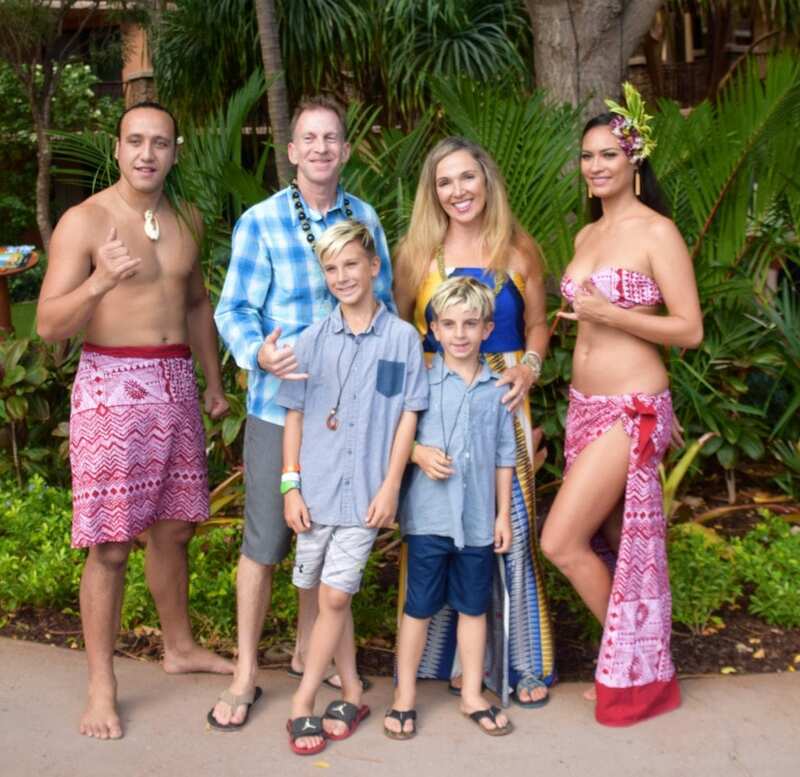 Aulani resort looks absolutely fabulous, and I’m surprised and impressed that Disney shows some sensitivity to local culture at the same time.